For other uses, see Sweet (disambiguation), Sweetness (disambiguation), and Sweetening (disambiguation). 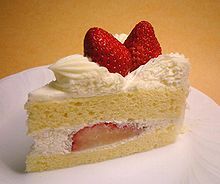 Sweet foods, such as this strawberry shortcake, are often for dessert. Sweetness is a basic taste most commonly perceived when eating foods rich in sugars. Sweet tastes are regarded as a pleasurable experience, except perhaps in excess. In addition to sugars like sucrose, many other chemical compounds are sweet, including aldehydes, ketones, and sugar alcohols. Some are sweet at very low concentrations, allowing their use as non-caloric sugar substitutes. Such non-sugar sweeteners include saccharin and aspartame. Other compounds, such as miraculin, may alter perception of sweetness itself. Studies indicate that responsiveness to sugars and sweetness has very ancient evolutionary beginnings, being manifest as chemotaxis even in motile bacteria such as E. coli. Newborn human infants also demonstrate preferences for high sugar concentrations and prefer solutions that are sweeter than lactose, the sugar found in breast milk. Sweetness appears to have the highest taste recognition threshold, being detectable at around 1 part in 200 of sucrose in solution. By comparison, bitterness appears to have the lowest detection threshold, at about 1 part in 2 million for quinine in solution. In the natural settings that human primate ancestors evolved in, sweetness intensity should indicate energy density, while bitterness tends to indicate toxicity. The high sweetness detection threshold and low bitterness detection threshold would have predisposed our primate ancestors to seek out sweet-tasting (and energy-dense) foods and avoid bitter-tasting foods. Even amongst leaf-eating primates, there is a tendency to prefer immature leaves, which tend to be higher in protein and lower in fibre and poisons than mature leaves. The 'sweet tooth' thus has an ancient evolutionary heritage, and while food processing has changed consumption patterns, human physiology remains largely unchanged. A great diversity of chemical compounds, such as aldehydes and ketones are sweet. Among common biological substances, all of the simple carbohydrates are sweet to at least some degree. Sucrose (table sugar) is the prototypical example of a sweet substance. Sucrose in solution has a sweetness perception rating of 1, and other substances are rated relative to this. For example, another sugar, fructose, is somewhat sweeter, being rated at 1.7 times the sweetness of sucrose. Some of the amino acids are mildly sweet: alanine, glycine, and serine are the sweetest. Some other amino acids are perceived as both sweet and bitter. A number of plant species produce glycosides that are sweet at concentrations much lower than sugar. The most well-known example is glycyrrhizin, the sweet component of licorice root, which is about 30 times sweeter than sucrose. Another commercially important example is stevioside, from the South American shrub Stevia rebaudiana. It is roughly 250 times sweeter than sucrose. Another class of potent natural sweeteners are the sweet proteins such as thaumatin, found in the West African katemfe fruit. Hen egg lysozyme, an antibiotic protein found in chicken eggs, is also sweet. Even some inorganic compounds are sweet, including beryllium chloride and Lead(II) acetate. The latter may have contributed to lead poisoning among the ancient Roman aristocracy: the Roman delicacy sapa was prepared by boiling soured wine (containing acetic acid) in lead pots. Hundreds of synthetic organic compounds are known to be sweet. The number of these that are legally permitted as food additives is, however, much smaller. For example, chloroform, nitrobenzene, and Ethylene glycol are sweet, but also toxic. As of 2005[update], seven artificial sweeteners are in widespread use: saccharin, cyclamate, aspartame, acesulfame potassium, sucralose, alitame, and neotame. A few substances alter the way sweet taste is perceived. One class of these inhibits the perception of sweet tastes, whether from sugars or from highly potent sweeteners. Commercially, the most important of these is lactisole, a compound produced by Domino Sugar. It is used in some jellies and other fruit preserves to bring out their fruit flavors by suppressing their otherwise strong sweetness. Two natural products have been documented to have similar sweetness-inhibiting properties: gymnemic acid, extracted from the leaves of the Indian vine Gymnema sylvestre and ziziphin, from the leaves of the Chinese jujube (Ziziphus jujuba). Gymnemic acid has been widely promoted within herbal medicine as a treatment for sugar cravings and diabetes mellitus. On the other hand, two plant proteins, miraculin and curculin, cause sour foods to taste sweet. Once the tongue has been exposed to either of these proteins, sourness is perceived as sweetness for up to an hour afterwards. While curculin has some innate sweet taste of its own, miraculin is by itself quite tasteless. Sweetness is perceived by the taste buds. Despite the wide variety of chemical substances known to be sweet, and knowledge that the ability to perceive sweet taste must reside in taste buds on the tongue, the biomolecular mechanism of sweet taste was sufficiently elusive that as recently as the 1990s, there was some doubt whether any single "sweetness receptor" actually exists. The breakthrough for the present understanding of sweetness occurred in 2001, when experiments with laboratory mice showed that mice possessing different versions of the gene T1R3 prefer sweet foods to different extents. Subsequent research has shown that the T1R3 protein forms a complex with a related protein, called T1R2, to form a G-protein coupled receptor that is the sweetness receptor in mammals. Human studies have shown that sweet taste receptors are not only found in tongue, but also in the lining of gastrointestinal tract as well as nasal epithelium, pancreatic islet cells, sperm and testes. It is proposed that the presence of sweet taste receptors in the GI tract controls the feeling of hunger and satiety. Another research has shown that the threshold of sweet taste perception is in direct correlation with the time of day. This is believed to be the consequence of oscillating leptin levels in blood that may impact the overall sweetness of food. Scientists hypothesize that this is an evolutionary relict of diurnal animals like humans. Sweetness perception may differ between species significantly. For example, even amongst the primates sweetness is quite variable. New World monkeys do not find aspartame sweet, while Old World monkeys and apes (including humans) all do. Felids like domestic cats cannot perceive sweetness at all. The ability to taste sweetness often atrophies genetically in species of carnivores who do not eat sweet foods like fruits, including bottlenose dolphins, sea lions, spotted hyenas and fossas. To depolarize the cell, and ultimately generate a response, the body uses different cells in the taste bud that each express a receptor for the perception of sweet, sour, salty, bitter or umami. Downstream of the taste receptor, the taste cells for sweet, bitter and umami share the same intracellular signalling pathway. Incoming sweet molecules bind to their receptors, which causes a conformational change in the molecule. This change activates the G-protein, gustducin, which in turn activates phospholipase C to generate inositol trisphosphate (IP3), this subsequently opens the IP3-receptor and induces calcium release from the endoplasmic reticulum. This increase in intracellular calcium activates the TRPM5 channel and induces cellular depolarization. The ATP release channel CALHM1 gets activated by the depolarization and releases ATP neurotransmitter which activates the afferent neurons innervating the taste bud. The color of food can affect sweetness perception. Adding more red color to a drink increases its perceived sweetness. In a study darker colored solutions were rated 2–10% higher than lighter ones despite having 1% less sucrose concentration. The effect of color is believed to be due to cognitive expectations. Some odors smell sweet and memory confuses whether sweetness was tasted or smelled. Lugduname is the sweetest chemical known. The development of organic chemistry in the 19th century introduced many new chemical compounds and the means to determine their molecular structures. Early organic chemists tasted many of their products, either intentionally (as a means of characterization) or accidentally (due to poor laboratory hygiene). One of the first attempts to draw systematic correlations between molecules' structures and their tastes was made by a German chemist, Georg Cohn, in 1914. He hypothesized that to evoke a certain taste, a molecule must contain some structural motif (called a sapophore) that produces that taste. With regard to sweetness, he noted that molecules containing multiple hydroxyl groups and those containing chlorine atoms are often sweet, and that among a series of structurally similar compounds, those with smaller molecular weights were often sweeter than the larger compounds. In 1919, Oertly and Myers proposed a more elaborate theory based on a then-current theory of color in synthetic dyes. They hypothesized that to be sweet, a compound must contain one each of two classes of structural motif, a glucophore and an auxogluc. Based on those compounds known to be sweet at the time, they proposed a list of six candidate glucophores and nine auxoglucs. From these beginnings in the early 20th century, the theory of sweetness enjoyed little further academic attention until 1963, when Robert Shallenberger and Terry Acree proposed the AH-B theory of sweetness. Simply put, they proposed that to be sweet, a compound must contain a hydrogen bond donor (AH) and a Lewis base (B) separated by about 0.3 nanometres. According to this theory, the AH-B unit of a sweetener binds with a corresponding AH-B unit on the biological sweetness receptor to produce the sensation of sweetness. B-X theory proposed by Lemont Kier in 1972. While previous researchers had noted that among some groups of compounds, there seemed to be a correlation between hydrophobicity and sweetness, this theory formalized these observations by proposing that to be sweet, a compound must have a third binding site (labeled X) that could interact with a hydrophobic site on the sweetness receptor via London dispersion forces. Later researchers have statistically analyzed the distances between the presumed AH, B, and X sites in several families of sweet substances to estimate the distances between these interaction sites on the sweetness receptor. The most elaborate theory of sweetness to date is the multipoint attachment theory (MPA) proposed by Jean-Marie Tinti and Claude Nofre in 1991. This theory involves a total of eight interaction sites between a sweetener and the sweetness receptor, although not all sweeteners interact with all eight sites. This model has successfully directed efforts aimed at finding highly potent sweeteners, including the most potent family of sweeteners known to date, the guanidine sweeteners. The most potent of these, lugduname, is about 225,000 times sweeter than sucrose. a. ^ Some variation in values is not uncommon between various studies. Such variations may arise from a range of methodological variables, from sampling to analysis and interpretation. Indeed, the taste index of 1, assigned to reference substances such as sucrose (for sweetness), hydrochloric acid (for sourness), quinine (for bitterness), and sodium chloride (for saltiness), is itself arbitrary for practical purposes. Some values, such as those for maltose and glucose, vary little. Others, such as aspartame and sodium saccharin, have much larger variation. Regardless of variation, the perceived intensity of substances relative to each reference substance remains consistent for taste ranking purposes. The indices table for McLaughlin & Margolskee (1994) for example, is essentially the same as that of Svrivastava & Rastogi (2003), Guyton & Hall (2006), and Joesten et al. (2007). The rankings are all the same, with any differences, where they exist, being in the values assigned from the studies from which they are derived. ^ Desor, J.A. 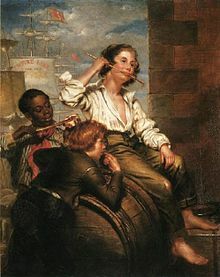 ; Maller, O.; Turner, R.E. (1973). "Taste acceptance of sugars by human infants". Journal of Comparative and Physiological Psychology. 84 (3): 496–501. doi:10.1037/h0034906. PMID 4745817. ^ Schiffman, Susan S.; Schiffman, Susan S. (2 June 1983). "Taste and smell in disease (Second of two parts)". The New England Journal of Medicine. 308 (22): 1337–43. doi:10.1056/NEJM198306023082207. PMID 6341845. ^ McAleer, N. (1985). The Body Almanac: Mind-boggling facts about today's human body and high-tech medicine. New York: Doubleday. ^ Altman, S. (1989). "The monkey and the fig: A Socratic dialogue on evolutionary themes". American Scientist. 77: 256–263. ^ Johns, T. (1990). With Bitter Herbs They Shall Eat It: Chemical ecology and the origins of human diet and medicine. Tucson: University of Arizona Press. ^ Logue, A.W. (1986). The Psychology of Eating and Drinking. New York: W.H. Freeman. ^ Jones, S.; Martin, R.; Pilbeam, D. (1994). The Cambridge Encyclopedia of Human Evolution. Cambridge: Cambridge University Press. ^ Fischler, C. (1980). "Food habits, social change and the nature/culture dilemma". Social Science Information. 19 (6): 937–953. doi:10.1177/053901848001900603. ^ Milton, K. (1993). "Diet and primate evolution". Scientific American. 269 (2): 70–77. ^ a b Guyton, Arthur C. (1991). Textbook of Medical Physiology (8th ed.). Philadelphia: W.B. Saunders. ^ John McMurry (1998). Organic Chemistry (4th ed.). Brooks/Cole. p. 468. ISBN 978-0-13-286261-5. ^ a b McLaughlin, Susan; Margolskee, Rorbert F (November–December 1994). "The Sense of Taste". American Scientist. 82 (6): 538–545. ^ a b Joesten, Melvin D; Hogg, John L; Castellion, Mary E (2007). "Sweeteness Relative to Sucrose (table)". The World of Chemistry: Essentials (4th ed.). Belmont, California: Thomson Brooks/Cole. p. 359. ISBN 978-0-495-01213-9. Retrieved 14 September 2010. ^ Couper RTL. ; Fernandez, P. L.; Alonso, P. L. (2006). "The Severe Gout of Emperor Charles V". N Engl J Med. 355 (18): 1935–36. doi:10.1056/NEJMc062352. PMID 17079773. ^ Kurihara Y (1992). "Characteristics of antisweet substances, sweet proteins, and sweetness-inducing proteins". Crit Rev Food Sci Nutr. 32 (3): 231–52. doi:10.1080/10408399209527598. PMID 1418601. ^ Kurihara K, Beidler LM (1968). "Taste-Modifying Protein from Miracle Fruit". Science. 161 (3847): 1241–3. doi:10.1126/science.161.3847.1241. PMID 5673432. Archived from the original on 2007-10-24. ^ Yamashita H, Akabane T, Kurihara Y (April 1995). "Activity and stability of a new sweet protein with taste-modifying action, curculin". Chem. Senses. 20 (2): 239–43. doi:10.1093/chemse/20.2.239. PMID 7583017. Archived from the original on 2012-07-30. ^ Li XD, Staszewski L, Xu H, Durick K, Zoller M, Adler E (2002). "Human receptors for sweet and umami taste". Proc. Natl. Acad. Sci. U.S.A. 99 (7): 4692–6. doi:10.1073/pnas.072090199. PMC 123709. PMID 11917125. ^ Kohno, Daisuke (2017-04-04). "Sweet taste receptor in the hypothalamus: a potential new player in glucose sensing in the hypothalamus". The Journal of Physiological Sciences. 67 (4): 459–465. doi:10.1007/s12576-017-0535-y. ISSN 1880-6546. PMID 28378265. ^ Nakamura, Y.; Sanematsu, K.; Ohta, R.; Shirosaki, S.; Koyano, K.; Nonaka, K.; Shigemura, N.; Ninomiya, Y. (2008-07-15). "Diurnal Variation of Human Sweet Taste Recognition Thresholds Is Correlated With Plasma Leptin Levels". Diabetes. 57 (10): 2661–2665. doi:10.2337/db07-1103. ISSN 0012-1797. PMC 2551675. PMID 18633111. ^ Nofre, C.; Tinti, J. M.; Glaser, D. (1995). "Evolution of the Sweetness Receptor in Primates. I. Why Does Alitame Taste Sweet in all Prosimians and Simians, and Aspartame only in Old World Simians?" (PDF). Chemical Senses. 20 (5): 573–584. doi:10.1093/chemse/20.5.573. PMID 8564432. ^ Biello, David (August 16, 2007). "Strange but True: Cats Cannot Taste Sweets". Scientific American. Archived from the original on March 19, 2011. Retrieved July 28, 2009. ^ Chaudhari, N; Roper, SD (9 August 2010). "The cell biology of taste". The Journal of Cell Biology. 190 (3): 285–96. doi:10.1083/jcb.201003144. PMC 2922655. PMID 20696704. ^ Philippaert, Koenraad; Pironet, Andy; Mesuere, Margot; Sones, William; Vermeiren, Laura; Kerselaers, Sara; Pinto, Sílvia; Segal, Andrei; Antoine, Nancy; Gysemans, Conny; Laureys, Jos; Lemaire, Katleen; Gilon, Patrick; Cuypers, Eva; Tytgat, Jan; Mathieu, Chantal; Schuit, Frans; Rorsman, Patrik; Talavera, Karel; Voets, Thomas; Vennekens, Rudi (31 March 2017). "Steviol glycosides enhance pancreatic beta-cell function and taste sensation by potentiation of TRPM5 channel activity". Nature Communications. 8: 14733. doi:10.1038/ncomms14733. PMC 5380970. PMID 28361903. ^ Huang, YA; Roper, SD (1 July 2010). "Intracellular Ca(2+) and TRPM5-mediated membrane depolarization produce ATP secretion from taste receptor cells". The Journal of Physiology. 588 (Pt 13): 2343–50. doi:10.1113/jphysiol.2010.191106. PMC 2915511. PMID 20498227. ^ Taruno, A; Vingtdeux, V; Ohmoto, M; Ma, Z; Dvoryanchikov, G; Li, A; Adrien, L; Zhao, H; Leung, S; Abernethy, M; Koppel, J; Davies, P; Civan, MM; Chaudhari, N; Matsumoto, I; Hellekant, G; Tordoff, MG; Marambaud, P; Foskett, JK (14 March 2013). "CALHM1 ion channel mediates purinergic neurotransmission of sweet, bitter and umami tastes". Nature. 495 (7440): 223–6. doi:10.1038/nature11906. PMC 3600154. PMID 23467090. ^ Ma, Z; Siebert, AP; Cheung, KH; Lee, RJ; Johnson, B; Cohen, AS; Vingtdeux, V; Marambaud, P; Foskett, JK (10 July 2012). "Calcium homeostasis modulator 1 (CALHM1) is the pore-forming subunit of an ion channel that mediates extracellular Ca2+ regulation of neuronal excitability". Proceedings of the National Academy of Sciences of the United States of America. 109 (28): E1963–71. doi:10.1073/pnas.1204023109. PMC 3396471. PMID 22711817. ^ Johnson, J.; Clydesdale, F. (1982). "Perceived sweetness and redness in colored sucrose solutions". Journal of Food Science. 47 (3): 747–752. doi:10.1111/j.1365-2621.1982.tb12706.x. ^ Shankar MU, Levitan CA, Spence C (2010). "Grape expectations: the role of cognitive influences in color-flavor interactions". Conscious. Cogn. 19 (1): 380–90. doi:10.1016/j.concog.2009.08.008. PMID 19828330. ^ Stevenson RJ, Oaten M (2010). "Sweet odours and sweet tastes are conflated in memory". Acta Psychol (Amst). 134 (1): 105–9. doi:10.1016/j.actpsy.2010.01.001. PMID 20097323. ^ John E. Hayes (2008). "Transdisciplinary Perspectives on Sweetness". Chemosensory Perception. 1 (1): 48–57. doi:10.1007/s12078-007-9003-z. Dobbing, John, ed. (1987). Sweetness. (papers presented at a symposium held in Geneva, May 21–23, 1986). London: Springer-Verlag. ISBN 978-0-387-17045-9. Kier L (1972). "A molecular theory of sweet taste". Journal of Pharmaceutical Sciences. 61 (9): 1394–1397. doi:10.1002/jps.2600610910. Kitagawa M, Kusakabe Y, Miura H, Ninomiya Y, Hino A (2001). "Molecular genetic identification of a candidate receptor gene for sweet taste". Biochemical and Biophysical Research Communications. 283 (1): 236–242. doi:10.1006/bbrc.2001.4760. PMID 11322794. Max M, Shanker YG, Huang LQ, Rong M, Liu Z, Campagne F, Weinstein H, Damak S, Margolskee RF (2001). "Tas1r3, encoding a new candidate taste receptor, is allelic to the sweet responsiveness locus Sac". Nature Genetics. 28 (1): 58–63. doi:10.1038/88270. PMID 11326277. Montmayeur JP, Liberles SD, Matsunami H, Buck LB (2001). "A candidate taste receptor gene near a sweet taste locus". Nature Neuroscience. 4 (5): 492–8. doi:10.1038/87440. PMID 11319557. Nelson G, Hoon MA, Chandrashekar J, Zhang YF, Ryba NJP, Zuker CS (2001). "Mammalian sweet taste receptors" (PDF). Cell. 106 (3): 381–390. doi:10.1016/S0092-8674(01)00451-2. PMID 11509186. Archived from the original (PDF) on 20 July 2011. Retrieved 13 September 2010. Nofre C, Tinti JM (1996). "Sweetness reception in man: the multipoint attachment theory". Food Chemistry. 56 (3): 263–274. doi:10.1016/0308-8146(96)00023-4. Parkes, A.S (January 1963). "Olfactory and Gustatory Discrimination in Man and Animals". Proceedings of the Royal Society of Medicine. 56 (1): 47–51. PMC 1896974. PMID 13941509. Sainz E, Korley JN, Battey JF, Sullivan SL (2001). "Identification of a novel member of the T1R family of putative taste receptors". Journal of Neurochemistry. 77 (3): 896–903. doi:10.1046/j.1471-4159.2001.00292.x. PMID 11331418. Schiffman, Susan S (26 May 1983). "Taste and smell in disease (First of two parts)". The New England Journal of Medicine. 308 (21): 1275–9. doi:10.1056/nejm198305263082107. PMID 6341841. Schiffman, Susan S.; Lockhead, Elaine; Maes, Frans W (October 1983). "Amiloride reduces the taste intensity of Na+ and Li+ salts and sweeteners". Proc. Natl. Acad. Sci. U.S.A. 80 (19): 6136–640. doi:10.1073/pnas.80.19.6136. PMC 534376. PMID 6577473. Schiffman, S.S.; Diaz, C; Beeker, T.G (March 1986). "Caffeine Intensifies Taste of Certain Sweeteners: Role of Adenosine Receptor". Pharmacology Biochemistry and Behavior. 24 (3): 429–432. doi:10.1016/0091-3057(86)90536-8. Susan S. Schiffman; Elizabeth A. Sattely-Miller (2000). "Synergism among Ternary Mixtures of Fourteen Sweeteners". Chemical Senses. 25 (2): 131–140. doi:10.1093/chemse/25.2.131. PMID 10781019. Retrieved 2007-09-02. Shallenberger RS (1963). "Hydrogen bonding and the varying sweetness of the sugars". Journal of Food Science. 28 (5): 584–9. doi:10.1111/j.1365-2621.1963.tb00247.x. Tinti, Jean-Marie; Nofre, Claude (1991). "Why does a sweetener taste sweet? A new model". In Walters, D.E. ; Orthoefer, F.T; DuBois, G.E. Sweeteners: Discovery, Molecular Design, and Chemoreception. ACS Symposium Series. 450. Washington DC: American Chemical Society. pp. 209–213. Castro DC, Berridge KC (2014). "Opioid hedonic hotspot in nucleus accumbens shell: mu, delta, and kappa maps for enhancement of sweetness "liking" and "wanting"". J. Neurosci. 34 (12): 4239–50. doi:10.1523/JNEUROSCI.4458-13.2014. PMC 3960467. PMID 24647944. Peciña S, Berridge KC (2005). "Hedonic hot spot in nucleus accumbens shell: where do mu-opioids cause increased hedonic impact of sweetness?". J. Neurosci. 25 (50): 11777–86. doi:10.1523/JNEUROSCI.2329-05.2005. PMID 16354936.